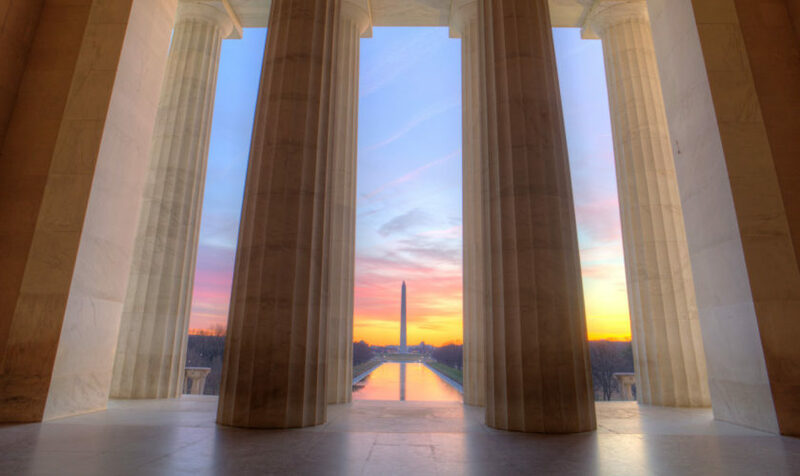 Free trade increases access to higher-quality, lower-priced goods. 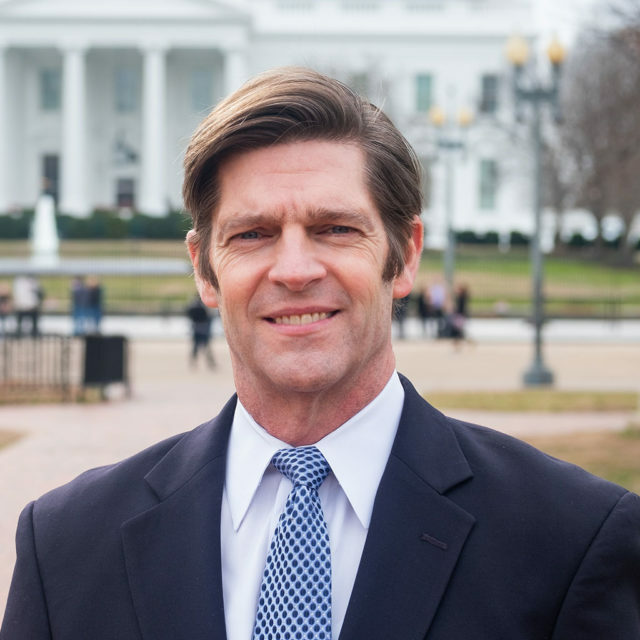 More affordable imports help ease inflationary pressure in the United States. 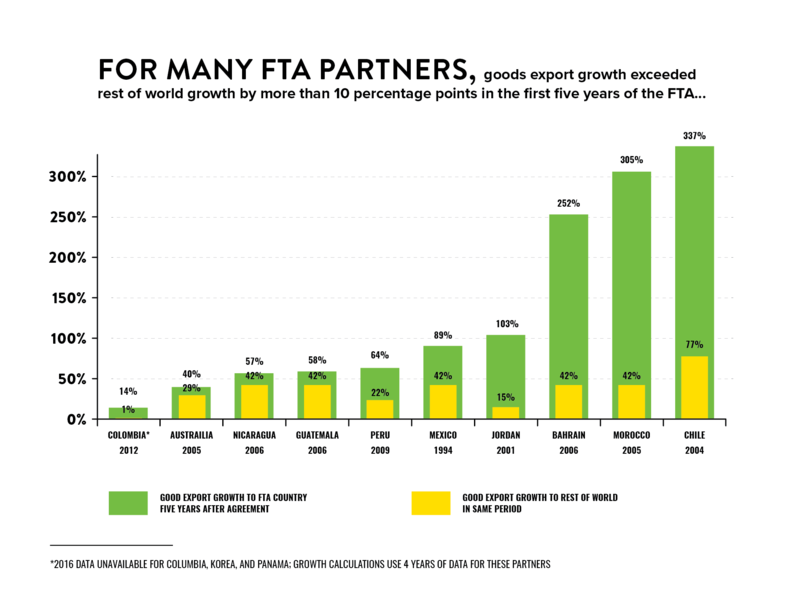 Free trade means more growth. Opening markets fuels export growth. Even growing imports can promote jobs here at home. Half of all imports are not finished consumer goods, but intermediate inputs used by U.S.-based producers, according to research published by the Bureau of Economic Analysis. Free trade improves efficiency and innovation. Over time, free trade works with other market processes to shift workers and resources to more productive uses, allowing more efficient industries to thrive. Free trade promotes fairness. When all parties follow the same rules-based system, there is less opportunity for cronyism, or the ability of participating nations to skew trade advantages toward favored parties. Free trade agreements help exporters sell more and expand operations. Jobs in export-intensive industries pay about 16 percent more than other industries. The benefits of trade pass through to many different sectors of the economy. Based on a 2016 U.S. Department of Agriculture estimate, for every $1 of agricultural exports, another $1.28 is generated in business activity. U.S. agriculture exports support more than 1 million jobs on and off the farm. This includes transportation workers, food processors, sales and marketing representatives, packers, and longshoremen. Exports also provide job security for well-paid positions in the corn refining industry and further economic growth in the rural communities where plants are located. Agricultural exports contribute hundreds of billions of dollars to the U.S. gross domestic product. The agricultural trade surplus is helping to offset some of the overall U.S. trade deficit. The World Trade Organization (WTO) and related trade agreements set strong, enforceable rules and obligations between member countries. 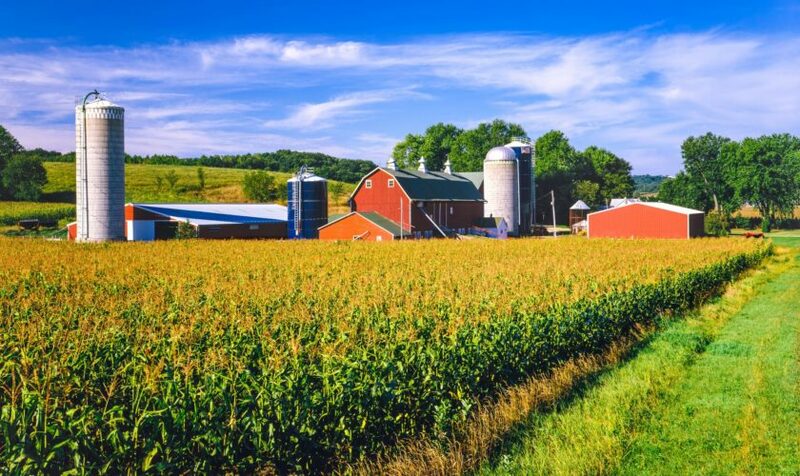 United States participation in the WTO and trade agreements with 20 countries ensures that the corn refining industry’s investments are secure at home and abroad. Free trade is where the future is. 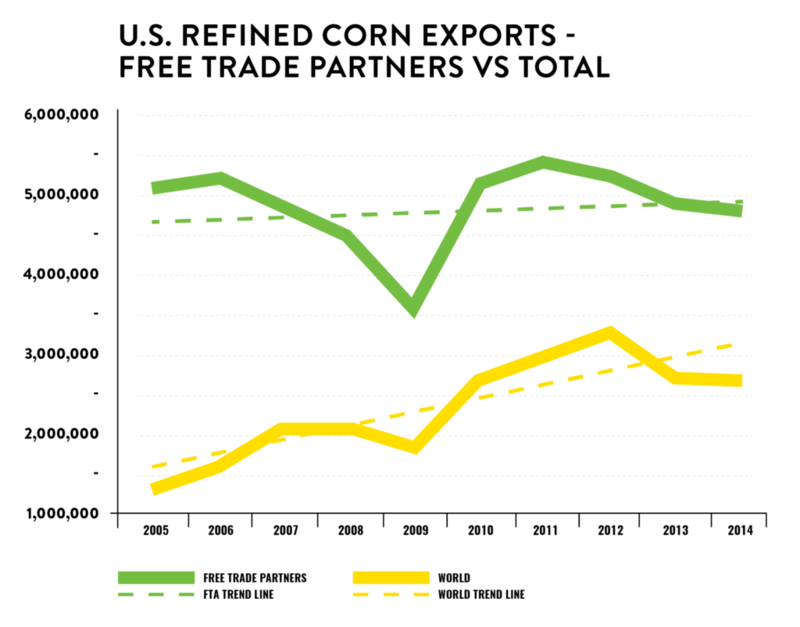 Corn refiners have seen exports to free trade partners grow faster than other markets. If we want to grow our economy, we need to trade more.